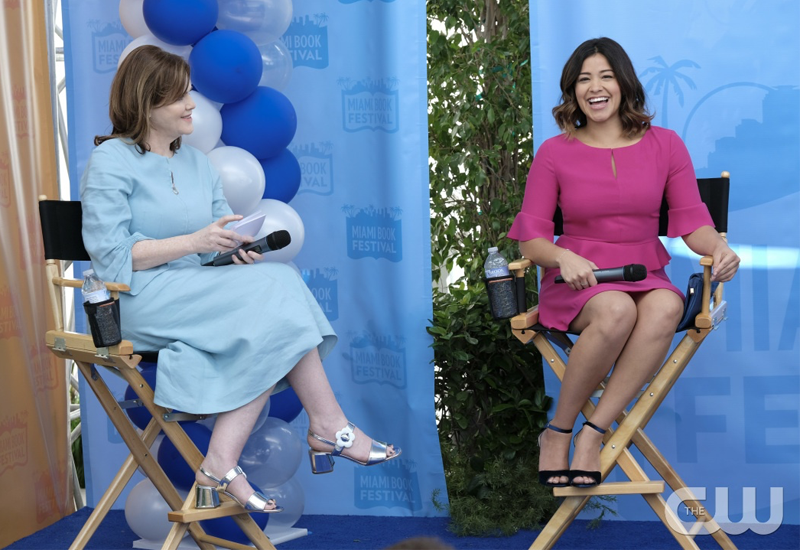 Ever since season 1 of Jane the Virgin, Jane Gloriana Villanueva has wanted to publish a romance novel. It’s part of the show’s conceit. And now in Season 3 we finally get to see Jane enter the publishing world a la one of our other favorite shows, Younger. For a Hollywood-based series, the show actually gets a lot about publishing right. And some things…very wrong. As a book editor myself, it’s literally my job to fact check. So let’s recap, shall we? Jane gets a job with a “high-powered publisher” in Miami. Not to offend or discredit any book publishers in Miami, but the major “high powered” publishers are based in New York. As far as I know, none have a Miami outpost. There are a number of well-known magazines based in Miami, but no book publishers. This is a nice piece of fiction, so we’ll let it slide. After Jane does a reading, a publisher offers her a book deal! This felt like a bit of a stretch. Most big publishing houses (and I’m going to assume this is a big publishing house for reasons below) require that all submissions come from an agent. If an editor did go to a reading and loved someone’s work, he or she would ask to read the whole manuscript, have a phone call or in-person meeting with the author, and –if the author is un-agented—help set them up with the appropriate representation. So, sure, this could plausibly happen, but a number of steps are missing here. So Jane quits her job, and then realizes she doesn’t get that advance all at once. Oh God, this was physically painful for me to watch. I wanted to yell to my laptop, “You don’t get that in one lump sum!” I thought that initially someone on the show hadn’t done his or her homework on the publishing world, so imagine my delight when they turned this into a plot point! Most advances are split into quarters or thirds. Jane mentions three payments, so she should get $16,666 on the signing of her contract; $16,666 on delivery and acceptance of the full manuscript; and $16,667 on publication. She mentions in the show that she gets $5,000 on signing, $5,000 on delivery of the manuscript as $40,000 “after the book is published.” It would be highly unusual to backload this way. “Hit books are few and far between.” Jane is being practical here. No matter how much an editor loves a book, no matter how much a team loves a book, sometimes the magic just doesn’t happen. Jane’s editor missed that Josephine loved Rake—and I’m fine with it! An editor is going to miss things. An editor’s job is to ask questions. This doesn’t mean that an editor isn’t paying attention or doesn’t understand the novel. It means that whatever was missed wasn’t clear enough and can be improved upon. Jane doesn’t have to take her editor’s notes. And despite some suggestions for improvement, he loves her book! This is all 100% accurate. Editors don’t buy books they don’t love—though it can be easy to lose sight of that in the throes of revision. And an editor’s notes are suggestions, an author doesn’t have to take them. If it doesn’t feel right or true to the author’s vision of the book, all of it is up for discussion. Jane tries to gain Twitter followers to get a spot at a book fair. First of all, Jane just turned in her manuscript, so it’s way premature to take part in a book fair, which is a publicity tool for authors with books that have already been published. Second, Jane turns to Rogelio and Fabian to help her get followers—the problem with this is that none of these followers are in the demographic that would help sell her book. Her publisher points this out. Authors are expected to promote their books, and social media can be a big part of this (but isn’t necessarily!) A publisher’s marketing team will often look at and analyze an author’s followers, and having a ton of followers but low engagement would be a warning sign. Overall, kudos to the fantastic writers for not only getting so much right about the publishing world, but incorporating these storylines seamlessly into the dramatic, hilarious world of Jane the Virgin. And oh yeah—there are only three episodes left in the season so don’t forget to watch tonight at 9:00 on The CW! Kaitlin Olson is an assistant editor at Touchstone Books. Her previous works include “The Bee Who Stung Me” (Mrs. Von der Ahe’s Class & Co., 1998), an unauthorized theatrical adaptation of “A Series of Unfortunate Events: The Wide Window” (Mom & Dad Productions, 2003), and “Math Poetry” (Extra Credit, Inc., 2008). Her writing has also appeared online at Matchbook Magazine, The American Prospect, and Los Angeles Magazine.